It's hard to believe that such decadence can occur without any milk, eggs, nuts, and now soy. This chocolatier changed their name from Premium Chocolatiers to No Whey Foods and went top allergen-free! The switch didn't effect the deliciousness of these truffles, which we think can fool any dairy consumer. They use white, "milk", and dark chocolate for the fillings, coatings, and garnish, all crafted in house. And unlike many truffles, these are all quite kid-friendly; even the Coffee and Grand Marnier were much milder than expected. I’ve updated this review to reflect the fact that Premium Chocolatiers became a top 8-free manufacturer and changed their name! Some of the pictures show the old look, but the tasting notes still hold true for what is now known as No Whey chocolate truffles and boxed chocolates. “They taste so good that no one will believe they are dairy-free!” I must admit, this phrase is a bit overused. 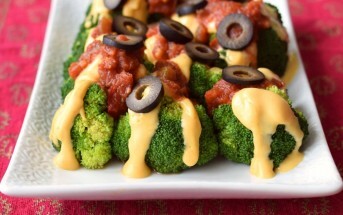 It also shamefully implies that dairy-free foods are somehow inferior to dairy-laden foods. Yet, for the rich chocolates created by Now Whey Foods, I found myself uttering these very words. In my defense, dairy-free boxed chocolates aren’t exactly commonplace. 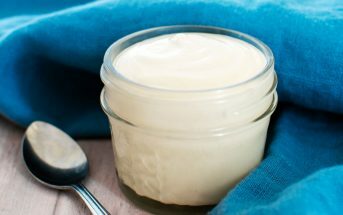 Truffle and caramel centers typically rely upon the luxuriousness of pure dairy cream. But not these gems. Seriously, if you really love someone (can someone make sure my husband is reading this? 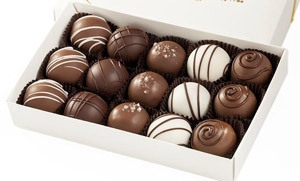 ), give them a box of No Whey Boxed Chocolates for Valentine’s Day. 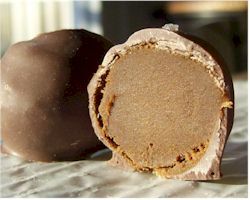 This is a picture of the actual No Whey Chocolate Truffles that I received when they were named Premium Chocolatiers. 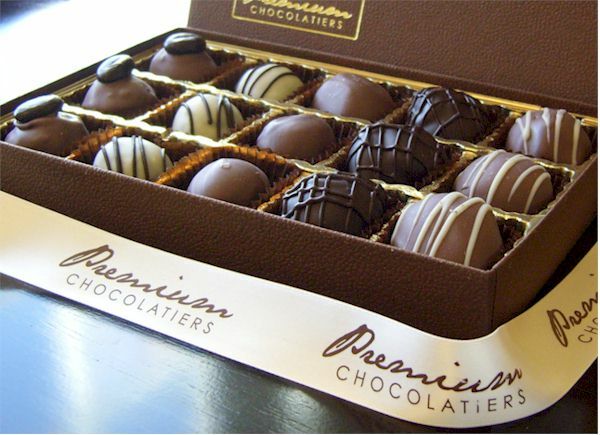 Your box will look different, but the truffles will be like this. As a fan of white chocolate, I lunged at these morsels first. The white chocolate coating was a bit thin, but it was perfectly smooth and sweet enough to hold its own while enhancing the decadently dark, soft truffle center. Overall the flavor and textural blend was a perfect marriage. I only wished there were more than three, so my husband and I didn’t have to fight over the last one! As a side note, this flavor is actually an excellent choice for all ages. It wasn’t too dark chocolate in taste, and there were no strong or “mature” notes such as almonds or liqueurs. It was just sweet, pure, and decadent beyond belief. This was actually the first truffle my husband sampled, and with a dead serious voice of concern, he said, “Are you SURE these don’t have dairy in them?” I showed him their website to quell his concerns, yet he still showed some signs of disbelief. Needless to say, he thought it was incredible. My first thought when I dove into this one was “What a monster!” For a truffle, this thing was huge, literally a fulfilling dessert in its own right. The coating was a thick layer (about twice as thick as the white chocolate) of truly milky chocolate. It was quite sweet, with a luxurious buttery aftertaste. The soft, creamy ganache center was a wonderful fudge-meets-whipped icing, melt in your mouth experience. Having eaten only dark and semi-sweet chocolate for years, this familiar yet distant flavor seemed very reminiscent of what milk chocolate was intended to be. I expected a bit more salty and caramel chewiness than this one delivered, but that’s certainly not a bad thing. The center was still soft, but it was more of a caramel-inspired chocolate truffle center enrobed in a milky chocolate blanket. See the photo at right, which I took, as an example. The center was deeper in flavor than your average sugary caramel, and had its own textural uniqueness. It didn’t stick to my teeth in the slightest. Rather, it melted nicely with just a slight, forgiving chew. I loved the contrast of the occasional speck of salt, but was somehow yearning for just a bit more of this contrast. I like fruit, and I like chocolate, but I rarely like the two together. However, I must admit that this was an impressive combination. The slightly milky, thick ganache center had what I think were little raspberry bits of interest amongst the smooth chocolate filling. 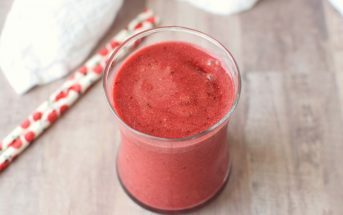 The raspberry flavor was sweet and fruity, yet mild, and it flowed beautifully with the overall semi-sweet center and bittersweet coating. Would I eat it again? You bet! Would it be my first choice? The Milk Fudge and Gran Marnier are still tied for first, but the Raspberry might just be a close second. By the way, this one also qualifies as generously sized, easily competing with the big Milk Fudge. Before taking my first bite of this chocolate, I ate what I think was a chocolate covered coffee bean nestled on top. I think because I have never had one before! It was soft, forgiving, more cocoa than coffee, and lovely really. In case you haven’t guessed by now, I am not a coffee fan. Hence why this flavor hit the last spot on my ‘tried’ list. Yet, this chocolate had a marvelously mild but definitively espresso-finished center, which was very soft, forgiving, and silky smooth. The milky semi-sweet coating was the pièce de résistance that led this coffee-hater to recommend the Coffee Chocolate as a post-dinner treat for anyone! Certifications: No Whey Chocolate Truffles are Certified Kosher Parve. 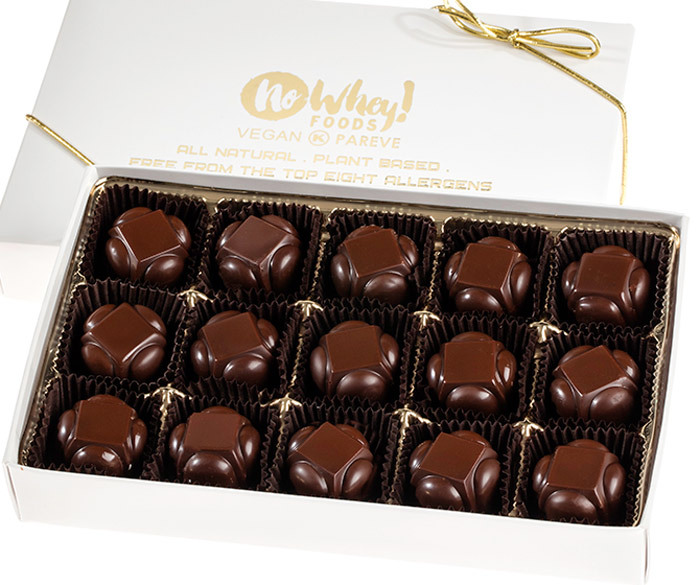 Dietary Notes: By ingredients, No Whey Chocolate Truffles are dairy-free / non-dairy, egg-free, gluten-free, peanut-free, soy-free, vegan / plant-based, and vegetarian. Nonetheless, always read the ingredient statement and check with the company on their manufacturing processes for all varieties if potential allergen cross-contamination is an issue for you. Processes and labeling are subject to change at any time for any company / product.